The massive storm system that spawned the deadly Leap Day tornadoes of Feb. 29, 2012. The massive storm system that spawned deadly tornadoes on Leap Day and is continuing to hammer large sections of the country today (March 2) was caught in a new video taken from space. The satellite animation shows the movement of the front that triggered dangerous thunderstorms and tornadoes in several states on Feb.29. From Feb. 28 into Feb. 29, the Storm Prediction Center received reports of 36 tornadoes. The tornadoes included a strong EF-4 twister in Harrisburg, Ill., a rarity for February. Several tornadoes have been rated EF-2 on the tornado damage scale, including the destructive twister that swept through the entertainment district in Branson, Mo. Nebraska recorded its first February tornado ever this week. Tornadoes on Feb. 29 raked Kansas, Nebraska, Illinois, Indiana, Missouri, Kentucky and Tennessee. The severe storms killed at least 12 people. The National Oceanic and Atmospheric Administration's GOES-13 satellite captured the new video of the deadly tornado-producing storm. The satellite captures visible and infrared images of weather over the eastern United States every 15 minutes. The 25-second movie of the Leap Day storms runs from Feb. 28 at 7:45 a.m. EST through March 1 at 7:45 a.m. EST. 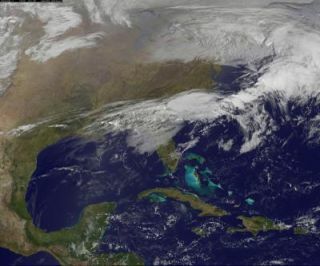 The video shows the progression of the cold front and associated low-pressure area moving over the country's midsection. By 1:45 a.m. EST on Feb. 29, a sharp line of clouds are seen in the movie, extending from the low in the central United States. That line of clouds grew larger as the front moved east and generated the severe weather. More severe weather is already under way today across the Deep South and Ohio River Valley. As of this morning, the severe storm risk area covered an estimated 162 million people, or 56 percent of the United States. "We actually are looking at a risk from the Gulf Coast to the Great Lakes to west of the Mississippi to the East Coast," Craig Fugate, director of the Federal Emergency Management Agency, told the Weather Channel. "And these storms are moving fast."